This dude and Semin, separated at birth. That is also assuming Semin was cryogenically frozen for a while. littlemoonboot wrote: This dude and Semin, separated at birth. That is also assuming Semin was cryogenically frozen for a while. It would certainly explain alot. 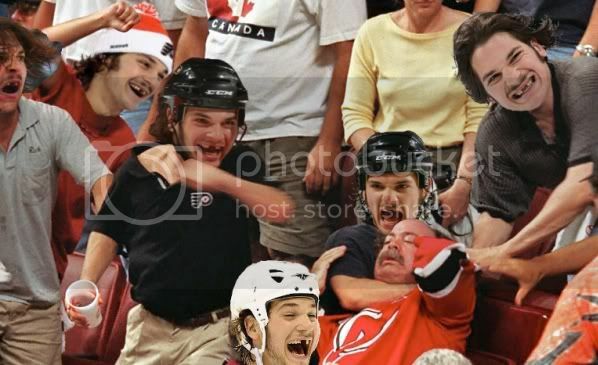 littlemoonboot wrote: I don't hate Pronger. In fact, I kind of like him. There, I said it. That video was like Karma and Justification combined. Well, that fan certainly learned quite a lesson in humility PWNED. Idoit40fans wrote: Is the Gordie Howe Hat Trick the most overrated accomplishment in sports? it's up there with 500 home runs. Ouch. Burned by the Corv. St. Louis has a guy named Anthony Nigro. And he's white! can not stop watching this, its the funniest thing ive seen all day. Major and legitimate laughing out loud. Also to JS... that is scary good.